Medical staff have placed "do not resuscitate" orders on thousands of patients in England without telling their families, an audit suggests. One in five families was not consulted where doctors had decided not to revive their relative, a sample study by The Royal College of Physicians found. Hospitals must "do better", and it was "unforgivable" not to tell families, report author Prof Sam Ahmedzai said. 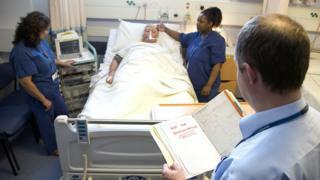 NHS England said end-of-life care had improved, but more could be done. A "do not resuscitate" (DNR) order means medical staff will not attempt to bring the patient back to life if they stop breathing or their heart stops. The decision to use one is ultimately a doctor's, but guidelines state medical staff have a duty to discuss it with relatives wherever possible. The study of just over 9,000 dying patients, taken from cases in May 2015, found that in 81% of cases where a DNR was in place, a senior doctor did discuss the decision with a family - up from 72% in a 2013 audit. In 16% of cases the decision was not discussed with relatives. In the other 4% of cases records showed there were no relatives or the family could not be contacted. Prof Ahmedzai, chairman of the audit, said in many cases there was no relative available to discuss the decision, or families could not be contacted in time. He stressed that often in the care of the dying, for example those suffering from terminal cancer or dementia, it did no medical good to attempt resuscitation on someone who was "slipping away peacefully". However, doctors and nurses needed to "do better" in terms of communicating with family members, as current practices were "not really acceptable", he said. "I think everybody has the spirit and the wish to do it. It's just that doctors and nurses are very busy in the front line," he said. There are large training programmes across the country to try to improve communication with families, he said. DNRs are "Do Not Resuscitate" orders. A DNR order on a patient's file means that a doctor is not required to resuscitate a patient if their heart stops and is designed to prevent unnecessary suffering. Guidelines issued by the British Medical Association and the Royal College of Nursing say that DNR orders should be issued only after discussion with patients or their family. Tony Bonser, who has campaigned for better end-of-life care after losing his son Neil at the age of 35 to a rare form of cancer, said it was crucial that doctors were open and honest with relatives as early as possible. "It will be a clinical and medical decision always, because they have the understanding, but it really must be discussed because otherwise it leaves people with so many bad memories, so much anger and so much guilt after the person they love has died." Mr Bonser said in the case of his son "the decision was made about him and we weren't part of that discussion". Prof Ahmedzai said doctors needed to be more open with dying patients - particularly as half of patients identified as likely to be dying were dead within a day. "This is being done very late in the day - as doctors we just don't like to face up to it," he added. An NHS England spokeswoman said there had been some improvement in the care provided, "but there is clearly more that can be done". The snapshot of end-of-life care showed "clear variations" in services across hospitals, she said.